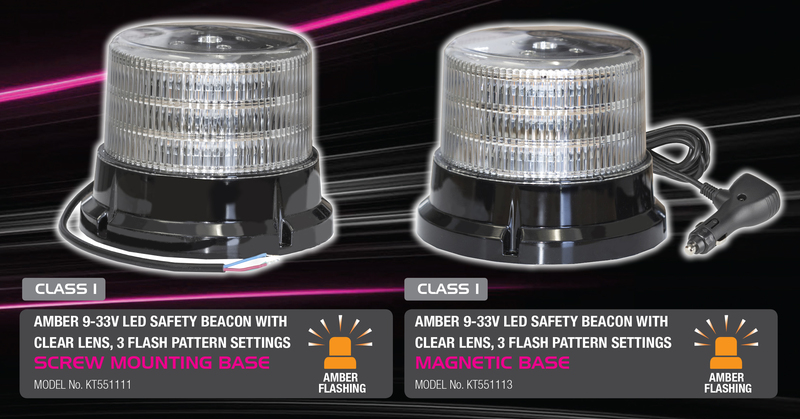 KT LED Amber Beacons feature Three Flash Pattern Settings and are available with Magnetic Bases and Screw Mount Bases to suit a variety of applications. Manufactured using impact resistant Clear poly-carbonate, this range of L.E.D Warning Lights are durable for use in extreme weather and rugged environments including work sites, mining sites, construction sites and more! KT LED Beacons are Class 1 rated. Quality cable exit and Denko breather ensures moisture and dirt cannot damage the lamp. 8 Strong magnets ensure the lamp grips the surface firmly while the silicone cover prevents scratching.